Author: AUTHOR OF "MAID MARJORY", "LITTLE HINGES" &C.
Description: London, Cassell & Company 21st thousand. 1895 by catal.date Plates (4) + text illustrations and head- and tailpieces. . Small octavo grey cloth with red decorations and gilt lettering to cover and spine (some ink staining/tips slightly worn) 128pp + pp publisher's catalogue dated May 1895. 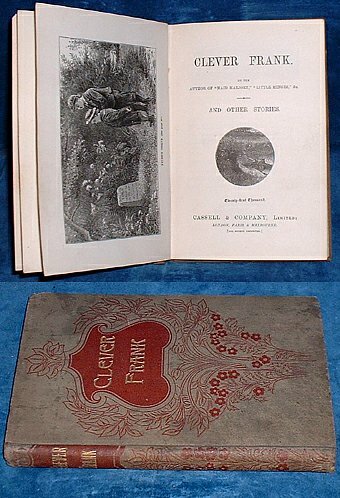 School prize bookplate presented to Cecil Rea April 1896. Victorian blindstamp bookseller stamp on flyleaf else neat and tight. *Several stories about boys disobedience getting them into trouble. The first about a boy who is too clever at getting his own way without being found out. He grows even more sure of being able to find his way out of trouble that he manages to cheat at his exams in school but finally his ingenuity is turned to outright swindling & he is jailed.